The opening letter from Shauna Hallmark, director for InTrans, cites some of the milestones InTrans is marking this year. She notes that InTrans collaborates with 31 ISU engineering faculty members who work with 72 researchers, engineers, and professional staff. InTrans is also the academic research home to 140 graduate students who help carry out the 220+ projects currently underway. Readers will find stories of progress, accomplishment, and exploration in transportation. InTrans sponsored an Innovation Training Day and several educational events that focused on traffic and safety. Staff and students received awards from ISU and from engineering and government groups. Staff from the National Concrete Pavement Center were active in a national effort to promote improved performance concrete mixtures. Bridges received considerable attention as InTrans specialists explored ways to improve construction practices. Big data was a key tool for researchers looking for ways to dissect complex traffic patterns and put that knowledge to work at devising improved safety measures. The new report can be downloaded in PDF format. Print copies of the report are available by emailing a request to intranspubs@iastate.edu. 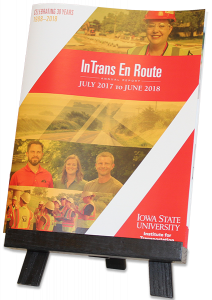 InTrans was established in 1988 and has grown from a single research grant on highway safety to an Iowa State University institute encompassing the activities and research of 15 centers and programs dealing all aspects of transportation. Print copies of the report are available by emailing a request to intranspubs@iastate.edu.